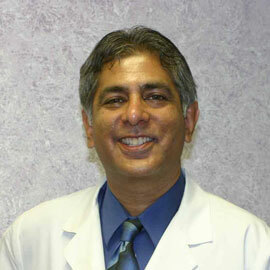 Dr. Virind "Steven" Gupta is Medical Director of Bee Ridge Family Practice and The Health and Self Enhancement Center. He was born in Bombay, India, where he obtained his medical training, graduating from the University of Bombay in 1981. In 1983, he immigrated to the United States where he attended and completed his residency training from Iowa Lutheran Hospital in Des Moines, Iowa in 1988, then relocated to Sarasota, Florida 1990 where he established Bee Ridge Family Practice. He has had extensive ER experience and worked in various emergency rooms. He became board certified by the American Board of Family Medicine in 1988 recertifying in 1994 as a Diplomat. He became certified in 1996 as a Diplomat of the American Board of Obesity Medicine, adding a specialty in weight loss. Over the years, he traveled widely to obtain further training in Surgical Hair Restoration, Laser Hair Removal and, anti-aging medicine. He has demonstrated his techniques to various hair transplant surgeons in the United States and abroad. Prior to setting up the Health and Self Enhancement Center, Dr. Gupta was the Consultant and hair transplant surgeon for the Alpha Omega Clinic, a very busy hair transplantation practice in Tampa, Florida and performed all of the surgical procedures for this clinic from 1996-1998. Hair restoration surgeries are performed Sundays, on site with a team of surgical techs specializing in transplant surgeries. Bee Ridge Family Practice also offers services in drug and alcohol detox. Dr. Gupta was Medical Director of First Step from 1984-1987. He has extensive experience in dealing with and treating patients with alcohol and drug additions. Our facility offers a rapid outpatient treatment program for opioid and alcohol addictions and has had great success in helping patients detox. He has traveled to numerous conferences over the last 15 years, studying and learning about pain and detox and in 2014, he passed the exam with the American Board of Addiction Medicine, becoming certified in addiction medicine. *ABOM affiliated with the American Board of Medical Specialties.